Edward Mountagu (also referred to as Montagu), the Earl of Sandwich as depicted by artist Peter Lely here and from the National Portrait Gallery, was the generous benefactor and patron of Samuel Pepys. Several wonderful websites offer excellent short biographies and related background information on Lord Sandwich: British Civil Wars; 1911 Encyclopedia; Mountagu’s Regiment site; Montague Millennium; Hinchingbrooke House. For those subscribing to the Oxford Dictionary of National Biography, the biography by J.D. Davies is well worth reading. Sandwich’s surviving papers and letters are located in the British Museum and the Bodleian Library at Oxford. In the Clive Powell article referenced below, it appears that the Montagu family sold the remaining family papers to the National Maritime Museum. Powell tells us that the 5 volumes acquired from the family cover the period of 1656-1669 (overlapping Sam’s Diary) and provide “many insights into a soldier, politician, diplomat and naval commander who moved from one side to the other of the political divide”. In addition, there are letters between Pepys and Sandwich in the Maritime collection. Prior to the Diary Mountagu was a strong supporter of Oliver Cromwell and upon his death, supported his son Richard for the role of Protector. With the overthrow of Richard in April 1659, Mountagu slipped out of the political whirlwind, moved back to Hinchingbrooke, and remained publicly silent as the political factions maneuvered for control. In the first few months of the Diary, Mountagu secretly transitioned his loyalties to the Royalist cause and supported the reinstatement of Charles II. He was elected as a member of the Council of State, co-General at Sea (a role he shared with Monck), and Commissioner of the Admiralty. He prepared the fleet for the Restoration of the King and set sail (with Pepys on board), welcomed Charles II on board the Naseby on May 23, 1660 and arrived in Dover two days later. In return for this dutiful service Charles II made Mountagu the first Earl of Sandwich, Knight of the Garter and Master of the Wardrobe. Sandwich was given honorable naval duties including bringing other Royal exiles home to England, arranging for the cession of Tangier and bringing the betrothed Queen, Catherine of Braganza (and a portion of her promised dowry) from her homeland of Portugal. These activities, captured so well by Pepys in his Diary were also recorded first hand by Sandwich in his own Journal. In 1663, Sandwich, who had been ill early in the year, spent visibly less time at the King’s Court. During much of this time away he was taking care of family matters, although gossip began regarding an alleged relationship with a girl in Chelsea. As the gossip became more rampant, Sam decided to send his Lord a letter of reproof, which brought an abrupt stop to Sandwich’s visits to Chelsea, but perhaps damaged the closeness between the two men. In early 1665 during the Second Dutch War Sandwich had great success as a naval commander in the first Battle of Lowestoft . Later that year his reputation was unfortunately marred by the “prize-goods” incident and Sandwich was subsequently relived of his command. In 1666 he was sent to Spain as an Ambassador, where he remained until 1668. During this time he proved his value through his tactful negotiation and mediation, which led to an end to the ongoing war between Spain and Portugal. After Sam’s Diary ended, Sandwich returned to Naval duty and took an active role commanding a squadron in the Third Dutch War. He died aboard the Royal James during the Battle of Solebay in May of 1672. He was given a well-deserved hero’s funeral, regaining in his death the grand status that his lifetime of achievements so well deserved. If Sandwich was often the subject of popular and political attack in life, his reputation was fortunate in death. The publication of Pepys’s diary presented a picture of his “my lord” almost as a true Renaissance man: the generous patron, the cheerful if sometimes moody companion, the hopeless manager of money, the competent artist and musician. He had an ear for languages, mastering Spanish by the end of his embassy, and his fascination with topography, mathematics, astronomy, and navigation emerges clearly from his manuscript journals. The interest in Lord Sandwich’s life lies in achievement rather than in character, but some fragments of evidence may be collected to show what manner of man he was… He was excellent company, even for the King; though he made no epigrams like Buckingham or Rochester, he could deliver himself of an occasional droll remark, which balanced the want of a ready and scintillating wit. He was tolerant in opinion… For political intrigue he had no relish. His lonely youth gave him a certain detachment of opinion, and an independence of judgment, which made him appear a trimmer. In reality he lacked finesse; he put his country first, and followed whom he liked; he put principles before persons. He hated disorder, and he hated persecution. Three times he chose his path, and each time for security and good government. He left Manchester, who was weak, for Cromwell, who was strong; he left Cromwell when the law was outraged; he left Richard when he felt that Richard was incapable. His passion for order made him a monarchist; it mattered little whether Cromwell or Charles Stewart were King. And since he saw the Stewart monarchy was bound up with settled law and an established Church, he favored uniformity. Dissent spelt difference, and to Sandwich a settled horizon was all that mattered. He had been in England throughout all her troubles, and detested those who bade fair to shake the settlement. To his friends he was kindly and affectionate, not one of those who, in fickle times, rejoiced over the misfortunes of others. He bore no malice, and forgave as he had been forgiven… His friends were young and well-informed, and were not chosen for their political influence. Sandwich was as happy with John Evelyn, Sam Pepys… as he was with the most influential statesman… Any estrangement that came between Sandwich and Pepys was not due only to my Lord… The politician whom Sandwich best knew was Lord Clarendon, and everywhere in Clarendon’s writings Sandwich is spoken of with the greatest warmth, and not as one who ever acted the part of an enemy. It is a pity that he was careless over money matters, but it was a carelessness which quickly brought its own punishment, and for which he suffered and paid… The mistake over the prize-goods came of this flaw in Sandwich’s character, and can be excused upon no other grounds… Kind as a father, affectionate as a husband, it would scarcely be necessary to touch upon My Lords’ moral character were it not that he is the victim of an unfortunate mistake. The indictment brought against him [see Wheatley’s, Samuel Pepys And the World He Lived In, page 175], that he was of ‘a committee with somebody else for getting of Mrs. Stewart for the King’ does not refer to Lord Sandwich [but to his cousin Edward Mountagu], and the indictment breaks down (see the November 6, 1663 entry). Pepys, in addition to the Becke incident, gives some gossip about Lady Castlemaine, but in no case has he anything to offer worthy of credence. …Evelyn speaks of Sandwich as sober and chaste, while the Puritans regarded him as one who could check the spirit of profaneness then upon the nation. The mists of enmity cannot obscure his ability as a naval commander. He began his career at the age of thirty, without any previous training; he was conjoined in the command with one of our greatest Admirals, and proved a ready and an apt pupil, worthy of a higher place than that allotted to him in the ranks of our great seaman. His sailors appreciated, loved, and revered him. His powers of discipline were at once shown to be effective; through he never treated the men with undue harshness. In later years, he was looked upon as rather too lenient to them, but that was when cruelty was rife. From the age of eighteen he had been accustomed to leadership; he had the necessary sympathy and power, and his jovial personality gave him the right temper for the work. To state his exact contribution is impossible, but the man who outmaneuvered the Dutch in the Sound, who anticipated the Vicomte de Morogues’ idea of tactical concentration, who led through the enemy’s line off Lowestoft, who drew up the instructions for 1665, and who endeavored to save our fleet from the errors perpetrated in the third Dutch war, must be allowed at least a flash of the genius which inspired the greatest of his successors. In the end he showed that he was of the stuff of which seamen are made. His career was fitly crowned by the bravery of his last fight: the way in which he bore the brunt of the battle, and the manner of his death, are eloquent of his tenacity and courage. He wiped out all stains, and the pageantry of his funeral was a worthy memorial. In a conclave of seamen he need no longer sit below the salt. My L: Sandwich was prudent as well as Valiant, & allways govern’d his affairs with successe, and little losse, he was for deliberation & reason… Thus this gallant Person perish’d … & deplorable was the losse, of one of the best accomplish[ed] persons, not onely of this Nation but of any other: He was learned in Mathematics, in Musique, in Sea affaires, in Political: Had ben divers Embassies, was of a sweet obliging temper, Sober, Chast, infinitly ingenious & a true noble man, an ornament to the Court & his Prince, nor has he left any that approach his many Virtues behind him … I am yet heartily griev’d at this mightly losse, nor do I call it to my thoughts without emotion. Biographies about Lord Sandwich and his Journal are listed below. These books tend to be rare and may be available through your local library (with the help of the research department) or are sometimes available through the used book search. ‘The papers of Edward Montagu, first Earl of Sandwich (1625-72)’ by Clive Powell of the National Maritime Museum appearing in the Mariner’s Mirror volume 84 issue 4 (November 1998): 470 ff. This text was copied from Wikipedia on 11 January 2019 at 6:03AM. Edward Montagu, 1st Earl of Sandwich, Portrait of Edward Montagu by Peter Lely, ca. 1660-65. Edward Montagu, 1st Earl of Sandwich, KG, FRS (27 July 1625 – 28 May 1672) was an English landowner and Infantry officer who later became a naval officer and a politician who sat in the House of Commons at various times between 1645 and 1660. He served Oliver Cromwell loyally in the 1650s, but went on to play a considerable part in the Restoration of Charles II, and was rewarded with several Court offices. He served as the English Ambassador to Portugal 1661-1662, and Ambassador to Spain 1666-1668. He became an Admiral, serving in the two Anglo-Dutch Wars in the reign of Charles II, and was killed at the Battle of Solebay. Our best picture of him is contained in the diary of Samuel Pepys, who was his cousin and protégé. Montagu was the only surviving son of Sir Sidney Montagu (died 1644) by his first wife Paulina Pepys (died 1638) of Cottenham (who was the great-aunt of Samuel Pepys) and was brought up at Hinchingbrooke House. After his mother's death his father remarried Anne Isham (died 1676), daughter of Gregory Isham and widow of John Pay of Westminster. The marriage was happy, and relations between Anne and her stepson were cordial. He served the Cause of Parliament by raising a regiment of infantry in June 1643. In 1645, he was elected Member of Parliament for Huntingdonshire as a recruiter to the Long Parliament. He was nominated MP for Huntingdonshire in 1653 for the Barebones Parliament and was elected MP for Huntingdonshire in 1654 for the First Protectorate Parliament. He continued to serve in the army for the Commonwealth of England and, in 1656 he became a General at Sea, serving jointly with General at sea Robert Blake (admiral) in the Mediterranean, Portugal and Spain. Later, as the principal General at Sea, he blockaded Dunkirk before the Battle of the Dunes. Montagu enjoyed the trust and confidence of Cromwell, who appointed him to his Council of State. Montagu, on his side, never lost his admiration and respect for Cromwell, and was prepared to defend his record even after the Restoration. In 1656 he was re-elected MP for Huntingdonshire in the Second Protectorate Parliament; in 1658 he served in Cromwell's short lived Upper House. Sir Edward Montagu, 1st Earl of Sandwich, 1625–1672 by Sir Peter Lely, painted 1666, part of the Flagmen of Lowestoft series. He was a member of the influential group, known to their opponents as "the Kinglings" who strongly, but without success, urged Cromwell to proclaim himself King. Montagu was prepared to support a Cromwell dynasty, and in the confusion which followed Oliver's death remained loyal to his son Richard Cromwell during his brief and disastrous rule as Lord Protector. In 1660 Montagu was elected MP for Dover and Weymouth and Melcombe Regis and chose to sit for Dover in the Convention Parliament. Despite his record of loyal service to Oliver Cromwell, he was among the first men of influence to decide that, given the chaos which had followed Cromwell's death, the return of the Stuart dynasty was inevitable. He was accordingly one of the first to make contact with the exiled King, although he was discreet enough to conceal this even from close associates like Samuel Pepys. At the Restoration he served Charles II as Admiral, commanding the fleet that brought him back from exile in May 1660. Two months later, on 12 July 1660, he was created Baron Montagu of St Neots, Viscount Hinchingbrooke, and Earl of Sandwich. King Charles also made him a Knight of the Garter and appointed him Master of the Great Wardrobe, Admiral of the narrow seas (the English Channel), and Lieutenant Admiral to The Duke of York, Lord High Admiral of England. He carried St. Edward's staff at Charles' subsequent coronation. Edward Hyde, 1st Earl of Clarendon, who liked and admired Montagu, wrote that the conferring of these honours caused much resentment among those Royalists who had gone into exile with their King, and regarded Montagu as a "diehard" Cromwellian; yet adds that his charm of manner made it almost impossible to dislike him. He was appointed Ambassador Extraordinary to Portugal in 1661, and strongly favoured the Portuguese marriage, through which England obtained Mumbai and Tangier. Montagu, like others, saw a great future for Tangier as an international trade centre, and he commanded the fleet which took possession of the city in January 1662, purchasing a house there. Returning to England, in his capacity as Ambassador, he escorted the new Queen, Catherine of Braganza, from Lisbon. In the Second Anglo-Dutch War of 1665 to 1667 he fought at the Battle of Lowestoft, an English victory, but defeat at the Battle of Vågen led to him being removed from active service. His reputation suffered another serious blow when he failed to prevent his sailors from plundering a number of prize ships which he had brought in. By long standing custom the sailors could take any goods they found between the decks, but they were strictly forbidden to "break the bulk" i.e. ransack the ship's hold; yet this is just what Montagu, an easy-going man with a notoriously poor understanding of money matters, permitted. When this became widely known, the rumour spread that Montagu had unlawfully helped himself to a fortune, (in fact he seems to have taken less than he was entitled to) and the public, who were still enduring the horrors of the Great Plague of London, reacted with such unexpected fury that a minor mishap became a national affair: "the Prize Goods Scandal". Although Clarendon wrote that Montagu was too likeable to have any personal enemies, he did have political opponents, including his own superior at the Admiralty, James, Duke of York, and James' influential secretary Sir William Coventry, who were happy to exploit the scandal. He felt obliged to obtain a royal pardon: the King, mindful of his good services at the Restoration, willingly granted it. During his absence from battle Edward Montagu served as England's ambassador to Spain, replacing Sir Richard Fanshawe. This is further evidence that despite his unpopularity, he retained the King's confidence, although his political fortunes, like those of his friend and patron Clarendon, were in decline. Montagu himself had told Pepys the previous year not to put too much reliance on the friendship of any "great man". After the Great Fire of London Montagu downplayed the damage to the Spanish King, claiming that London's slums were the only thing in ashes. This slant on the events was also practiced by England's ambassadors throughout Europe. As Ambassador his most notable achievement was the Anglo-Spanish Commercial Treaty of 1667, which laid the foundations for a prosperous trading relationship between the two countries which lasted for over a century. He also acted as mediator in the peace negotiations between Spain and Portugal which resulted in the Treaty of Lisbon. Like all Ambassadors of the era he found the cost of running an embassy ruinous (he had never had a good head for business) and on his return to England in the autumn of 1668 one of his first actions was to borrow money from his cousin Samuel Pepys. On his way back from Spain, he again visited Tangier to report on the condition of the garrison there. In 1670 he escorted the King's sister Henrietta of England, Duchess of Orleans, from France to England to negotiate the Secret Treaty of Dover between her brother and Louis XIV. Of the existence of the Treaty's secret clauses, notably that by which Charles II pledged to convert to the Roman Catholic faith, Montagu, like the general public, was quite unaware. In the same year he was appointed President of the Privy Council Committee on Foreign Plantations; he had always had a keen interest in international trade, despite his notorious inability to keep his own finances in order. He was subsequently reappointed to a naval command, and by 1672 at the start of the Third Anglo-Dutch War he was Vice-Admiral of the Blue with the Royal James as his flagship. At the Battle of Solebay his ship was attacked by a group of fire ships and was destroyed with the loss of many lives, including Sandwich himself, whose charred body was found washed ashore and only recognizable from the remains of his clothing. Montagu, who had strongly opposed the War, and was increasingly prone to moods of melancholy, is said to have predicted his own death. Certainly he told his friend John Evelyn, just before he sailed, that "he would see him no more". Edward Montagu, 2nd Earl of Sandwich (1648–1688), married Lady Anne Boyle, daughter of Richard Boyle, 2nd Earl of Cork. Paulina's death in February 1669, aged only twenty, was a great source of grief to her father: Samuel Pepys, who disliked her ("a peevish lady"), called to pay his condolences but found Montagu "shut away for sorrow". Montagu himself wrote: "it pleased God to take unto himself my dear sweet daughter Paulina". This is an interesting glimpse not only of Montagu as a family man, but of his religious beliefs, and seems to contradict Pepys well-known remark that Montagu was "wholly sceptical in religion". Montagu was a loving and careful father to all his children: although the marriages he arranged for young Edward (Ned) and Jemima were clearly not love affairs, both seem to have been fairly happy. Jemima's death in childbirth in 1671 was no doubt a further blow to her father. Montagu on his mother's side was the first cousin of John Pepys, the father of Samuel Pepys. Pepys started his career as a minor member of the Montagu household and owed his appointments first to the Wardrobe and then as Clerk of the Acts to the Navy Board to Montagu's influence. Pepys' diary provides a detailed primary source for Montagu's career in the 1660s. They had a serious quarrel in 1663, when Pepys reprimanded Montagu for living openly with his mistress, Elizabeth Becke, at her "mean house" in Chelsea. Pepys was concerned at the damage to their family's reputation, Montagu's neglect of his official duties (risking the loss of any remaining influence he had at Court) and also at the insult to Montagu's wife, to whom Pepys was deeply attached. Following a brief estrangement, friendly relations were resumed, although the two men were probably never as close again as they had been (Pepys, for example, is not mentioned in Montagu's last will). For Pepys to raise the issue at all took considerable courage, considering how much he owed to his patron, and his Diary shows that he was strongly tempted to let the matter lie. Even when he did raise it he chose to write rather than confront Montagu face to face. In 1668 Pepys was somewhat perturbed when his wife Elizabeth, during one of the violent quarrels which followed the discovery of his affair with her companion Deb Willet, told him that Montagu had asked her to be his mistress. Since Pepys was in no doubt that she had refused, he decided to treat the matter as being closed, and friendly relations continued: Montagu dined at their house for the first time a few months later. Pepys, on reflection, may have thought it possible that Elizabeth in her anger had invented the story to upset him, (as she undoubtedly invented the story that she was attending Roman Catholic services). Whatever their differences, Pepys in later life always remembered Montagu, whom he called "that noble and unparalleled Lord", and his wife (who died in 1674) with affection and gratitude. ^ Edward Montagu (1692–1776) was a son by Sarah Rogers. Ollard, Richard Lawrence (1994). Cromwell's Earl : a life of Edward Montagu, 1st Earl of Sandwich. London: HarperCollins. ISBN 0-00-255003-2. "Montagu Genealogy". Retrieved 1 December 2006. The Journal of Edward Montagu, 1st Earl of Sandwich, admiral and general at sea, 1659-1665, edited by R.C. Anderson. Publications of the Navy Records Society, v. 64 (London, 1929). Colonel Edward Montagu's Regiment of Foote A Part of the English Civil War Society, Re-enacting the wars between 1642 and 1649. Sir Edward Montagu, born 1625, son of Sir Sidney Montagu, by Paulina, daughter of John Pepys of Cottenham, married Jemima, daughter of John Crew of Stene. He died in action against the Dutch in Southwold Bay, May 28th, 1672. Pepys and Edward Montagu/Mountagu are distant relations and attended the same school at Huntingdon, although several years apart. Montagu was a supporter of Oliver Cromwell and attained high positions within the Admiralty. Pepys' first job in London was working for Montagu from some time in the 1650s. He and his wife lodged at Montagu's house and Pepys managed the household, particularly during the many occasions Montagu was at sea. Even after finding employment elsewhere, Pepys continued to perform some administrative duties for him. One of Cromwell's young colonels in the Civil War, Montagu broke with extremists in the army in 1648 but became a member of Parliament in 1653. Later that year he was made a "councillor of state" in the government. Montagu had supported every proposal to make the protectorate hereditary and even the radical proposal to make Cromwell king. He also supported Cromwell's son, Richard, when he became protector. When Richard fell from power in 1659, Montagu "distanced himself, in common with many other moderates, from the revolutionary cause," Robert Latham writes in his introduction to "The Shorter Pepys," a 1990 abridgement of the diary. In the spring or summer of 1659 Montagu communicated with agents of Charles II. Montagu was suspected of disloyalty to the government and by winter he had retired to his country estate, Hinchingbrooke. Pepys remained in charge of his affairs in London. Edward Montagu was born on 27 July 1625 at Barnwell, Northamptonshire, and was admitted to the Middle Temple in 1635. He was commissioned to raise a regiment of 1,000 men for the Parliamentary forces in 1643, and was present at the siege of Lincoln as well as the Battles of Marston Moor and Naseby. After sitting as MP for Weymouth periodically from 1645 onwards and holding office in the Lord Protector's administration, he came to favour the Royalists after Richard Cromwell's fall and helped bring about the Restoration. 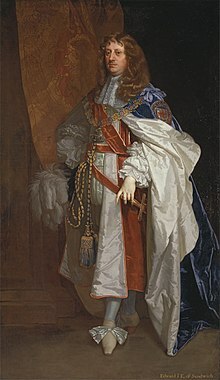 For his services he was created a Knight of the Garter as well as being ennobled as Baron Montagu of Saint Neots, Viscount Hinchingbrooke and Earl of Sandwich in 1660. He was Master of the Great Wardrobe until 1670, and distinguished himself as a naval commander against the Dutch throughout the 1660s, before losing his life, probably by drowning, when his flagship was attacked by fireships at the Battle of Solebay on 28 May 1672. He is buried in Henry VII's Chapel in Westminster Abbey. -- ". . . my Servant Samuell Pepys at my Lodginges in Whitehalle"
-- "You are upon sight hereoff . . ."
-- "Hereoff you are not to faile"
All the above is from Tomalin's "Samuel Pepys: The Unequalled Self" p. 6. "The losse of your Honours good word I am too sure will prove as much my undoing, as hitherto it hath beene my best friend." My ancestrial grand fathers rented strip farm land from Lord Mongagu in the 1600s and 1700s south of Dunchurch around a small village known as Toft Hamlet Warwickshire England. Their names were Abraham Barrs and his son John Barrs. They were prominent farmers there as was their ancestors and descendants. They paid hearth tax on 3 hearths during the 1600 period of the hearth tax. Paulina Pepys was the trusted servant of Elisabeth Montague , witness to her will, who subsequently married Sidney, Edwards' father ? "Item I give to Paulina Pepis now my woman and careful servant fifty pounds, the bed wherein she usually lies with the canopy and the rest of the furniture which belongs thereto and two pair of sheets out of the Iron bound chest which stands by the press in the chamber and the little black coffer also which stands in my 'cosett' with such trifles as are in it." It should perhaps also be mentioned that this is not the Earl of Sandwich credited with the invention of the popular eponymous food item. Around 100 years have still to pass before the Fourth Earl invents the sandwich in 1762, to avoid interrupting a gambling game. The present day Earl is President of the Samuel Pepys Club! Interested in the movements of Montagu since he left the English shores, to settle business in Algier, to secure Tangier ready for the handover, and to bring over the new Queen, I have tried to draw together Sam's comments. On the 26 Aug he received a letter dated 22 July, and so perhaps we could assume a months delay? I am wondering whether Sam receives some of the letters out of sequence and records them as they arrive, as taken in order they do not make sense. I would think that Montagu would first sail through the Straits and settle the business in Algier. He may have had to call at Alicante first, where he was taken sick, or maybe he went there because he was sick? After Algier he seems to go back through the Straits and up to Lisbon. Sam says that this is to bring over the Queen, but Tangier has not yet been secured. (12 June) where I met my Lord, who told me he must have 300l. laid out in cloth, to give in Barbary, as presents among the Turks. (13 June) (Montagu sails) So went and Captain Ferrers with me into our wherry, and my Lord did give five guns, all they had charged, which was the greatest respect my Lord could do me, and of which I was not a little proud. So with a sad and merry heart I left them sailing pleasantly from Erith, hoping to be in the Downs tomorrow early. (7 Aug) but no news yet from my Lord where he is. (26th Aug) At night at home I found a letter from my Lord Sandwich, who is now very well again of his feaver, but not yet gone from Alicante, where he lay sick, and was twice let blood. This letter dated the 22nd July last, which puts me out of doubt of his being ill.
(31 Aug) My Lord Sandwich in the Straits and newly recovered of a great sickness at Alicante. (24th Sep) and letters from sea, that speak of my Lord's being well, and his action, though not considerable of any side, at Argier. (30th Sep) where we are now very busy about the business of sending forces to Tangier, and the fleet to my Lord of Sandwich, who is now at Lisbon to bring over the Queen, who do now keep a Court as Queen of England. The business of Argier hath of late troubled me, because my Lord hath not done what he went for, though he did as much as any man in the world could have done. (25th Jan) with letters from my Lord Sandwich, speaking of his lying still at Tangier, looking for the fleet; which, we hope, is now in a good way thither. Summary from Richard Ollard's "Cromwell's Earl". June 13th Sandwich sails straight for the Med. July 4th Anchored off Malaga. Set off for Algiers but was struck down with fever. Off Alicante the fleet hove to and he was sent ashore. One week later he was well enough to return to the ship. July 29th Arrived at Algiers. After a council of war, he sent demands to the Algerians. They were refused as they said the death of Cromwell had abrogated Blake's treaty. The weather favoured defence and the fleet stood of to wait for better weather. One week later he left for Lisbon with 5 ships, leaving Lawson with 10 ships of the line, to make as much nuisance of himself as he could. Sep 6th He arrives at Lisbon, and stays for 4 weeks. Soon after arriving he receives the news of a substantial success gained by Lawson against the Algerians. Two merchant ships and two men of war had been captured and another driven ashore. Lawson is sent orders to join him in Tangier Bay. A few days before leaving he goes to the Bullfight. Oct 10th Anchored in Tangier Bay. Ollard and the Portuguese writer Casimiro both give description of the bullfight taken from Sandwich's Journal. Ollard mentions this in his biography, but only draws a few lines, and says that Sandwich reveals more of a talent as a fashion correspondent that that of a sports reporter. I find this a little strange as Casimiro, quoting from the same source, gives a much longer description. This of course is translated into Portuguese, and I translate back again, so sorry Sandy if there are a few errors! The show started with the entrance of a carriage with water, men and horses all in green, to water the arena and dampen down the dust. Following, various people grotesquely dressed in old fashioned costumes, with Guitars, rebecas, and tambourines, danced and circled in games and companies of artists. The Administrator of the City, on horseback, a splendid steed, came under the window of the King, awaiting his orders. Accompanying him were twelve men in coloured jackets, mid-green, the other six in yellow. Those in green, under orders from the King untied the first bull, injuring him with harpoons, forcing it to run about them, and dodging it, throwing their capes over its horns. Men with stakes also provoked it, and if it was chasing them, straightened the stakes and stopped it. The yellow jackets, when the bull was to be killed, went to it, and the first holding the middle of the horns and the others soon after immobilising it, cutting its hocks and killing it. After, came six horses covered in green fabric, with coachmen and footmen, who tied a rope to its horns and dragged it out of the arena. After three or four bulls were tired or killed by the footmen there was another let out and the Conde de Sarzedas came in upon a fine well-ranged horse, having seventy four lackeys came in before him, half in red liveries with silver lace, half in green with silver lace. He advanced directly to the royal platform, retreated and advanced three times greeting the King of Portugal and the Queen of England. Afterwards he went, in a serious and serene pace, in search of the bull. When the bull ran around the horse, the Count picked up a spear from the hands of a foot soldier and buried it between the horns of the animal at the nape of the neck, breaking it, and, each time that the bull came he did the same. Three or four times he went out to change mounts. They killed in total thirteen bulls that afternoon. When all the bulls had been killed, the Count came again to greet the King and Queen, and has had been done at the start, and went out. The dances started again and the feast ended at sundown. From Ollard's biography of Montagu I cannot find any references of his finances under Cromwell, but he says that although he was an acute and informed student of economic affairs when in government, was lazy and careless about money. He tells us that Clarendon says kindly things about his friend's character, but concedes that "avarice" was the sole blemish (though it never appeared in any gross instance) that seemed to cloud many noble virtues in that Earl. After the Restoration he granted lands worth L4000 a year: was made Privy Counsellor and a Commissioner of the Treasury and, richest of all prizes he had he bestirred himself to exploit it , Master of the Great Wardrobe. (He adds that the imagination boggles at what Pepys would have extracted from such a goldmine.) Other offices that came to him were Master of the King's Swans and Bailiff of Whittlesea Mere. Sandwich was one of the Garter knights who bore the canopy over the king's head at the coronation (23 April 1661). Additionally, he was elected to the Royal Society on 13 February 1661 and appointed master of the king's swans on 10 May, having become "lieutenant, or admiral and general of the narrow seas" (Journal, xxix) effectively vice-admiral of England on 18 March. The perennial disputes with the north African Barbary regencies over freedom of the seas, and the imminent marriage of Charles II to Catherine of Braganza, led to Sandwich's being sent with a fleet to the Mediterranean, with the additional title of ambassador-extraordinary to Portugal. He sailed in June 1661 and after recovering from a fever anchored before Algiers on 29 July and engaged in a desultory exchange of fire with the town. From September he was at Lisbon to begin the arrangements for the royal wedding, sailing on 3 October to take possession of Tangier, part of Catherine's dowry. His fleet oversaw the Portuguese evacuation and the arrival of the English garrison before sailing once more for Lisbon on 18 February. After a spectacular ceremonial entrance into the city, he spent two months conducting the protracted negotiations over the payment of Catherine's dowry. The fleet sailed on 15 April, arriving at Spithead on 14 May, and Sandwich attended the subsequent marriage ceremony at Portsmouth. I have some interest in Her Ladyship the Duchess of Sandwich, Dorothy. How ancient is her Peerage? How did she come by it? What is the current status? I would like to know details of the regiment, broken in 1660, of which Edward Montagu was colonel and Samuel Pepys secretary and muster master. Samuel Pepys and Edward Montagu were first cousins once removed. I don't think this relationship is correctly described as distant. William of Impington was (according Wheatley's notes to Mynors Bright's transcription)the grandfather of the Earl of Sandwich and the great-grandfather of Samuel Pepys which I believe makes them first cousins once removed. Sam does not have any Montague genes, but Montague dothe have a few Pepis genes? first, second cousin, etc. : expressing the relationship of persons descended the same number of steps in distinct lines from a common ancestor. Half-cousin The child of one's father's or mother's cousin; a second cousin. Sometimes applied to the child of one's own cousin, or to the cousin of one's father or mother. and gives the example 1871 Carlyle in Mrs. Carlyle's Lett. II. 231 ‘Sophy’, an orphan half-cousin. 6.7 Distinctions between relatives of the whole and half blood appear to have been relevant for the purposes of identifying an heir under the English law relating to the inheritance of land under primo genitur, so that, for example, brothers of the half blood could only inherit after sisters of the whole blood, and so on. ( Inheritance Act of 1833 (3&4 William IV c 106) s 9) This and other such distinctions in the law of heirship were described in 1881 (James LJ In re Goodman’s Trusts (1881) 17 ChD 266 at 299) as “precious absurdities in the English law of real property”. There would appear to be no justification for such a distinction in the law of intestate succession today. For the connexion with Samuel Pepys, the diarist, see the corrected Pepys ped(egree)., recently recorded in the College of Arms, in Wheatley, Pepysiana, facing p. 4, ex inform. W. A. Lindsay, Windsor Herald. He was the great-nephew of Paulina, Sir Sydney Montagu's wife, who was a sister of his grandfather Thomas Pepys, the elder. James, Duke of York and Albany, Earl of Ulster, Lord High Admiral of England and Ireland, etc. Constable of Dover Castle, Lord Warden of Cinque Ports and Governor of Portsmouth, etc. To Edward Earl of Sandwich my Lieutenant and Admiral and Captain General of the Narrow Seas, and Admiral of his Majesty's Fleet, now bound forth to the sea. So soon as his Majesty's ships (now in the Hope) shall be fully provided of their victuals and stores for four months, you are to order them to take the first opportunity of sailing into the Downs, where you are to take upon you the charge and command not only of the said ships, but likewise of such other of his Majesty's ships as you shall find there, or shall hereafter be sent thither for his Majesty's service, within his Majesty's seas. You are to take care that Almighty God be duly served on board the ship under your command twice every day by the whole ship's company, according to the Liturgy of the Church of England, and that blasphemy, drunkenness, swearing and profaneness be discountenanced, restrained and punished. You are from time to time to send out such of his Majesty's ships or vessels under your command as you shall judge fit, toward the coast of Holland, or to any other parts where you shall understand the Dutch fleet or any considerable part thereof shall be, to the end you may by that means have frequent and certain information of their number, strength and motion. You are to instruct the commanders of such ships or vessels as you shall so send forth, and all others, that they do not attempt any hostility against any of his Majesty's Allies, unless they shall refuse or neglect to strike sail unto his Majesty's ships, or to do such other things as are customarily done in acknowledgement of his Majesty's right and Sovereignty of the Sea. You are upon all occasions to take care that his Majesty's hounour be preserved, and his subjects protected and defended. You are to take care to preserve good order and discipline in his Majesty's fleet under your command, and to that end (as occasion shall require) you are to put in execution the Articles of War established by Act of Parliament, and to hold Courts Martial for punishing offenders, according to the Commission particularly granted to you on that behalf. You are to give me frequent notice of all occurrences which may any way concern his Majesty's service, to the end you may receive such further orders as may conduce to the good of his Majesty's service. Given under my hand at St. James's this ninth day of July 1664. (Endorsed by Sandwich) July 9, 1664. His Royal Highness. Instructions upon my first going to sea this summer. Correspondence of Edward Mountagu (Montagu), 1st Earl of Sandwich, forms part of the Carte collection at the Bodleian Library. An online calendar of the papers from the Restoration period (1660-1687) is available. "The Life of Edward Montagu, K. G., First Earl of Sandwich (1625-1672)"
And one by Robert Walker, c.1650. He has been active recently, advocating the case of farmers, who fear that their finances might be damaged by the recent Brexit vote in the EU referendum. It is certain the whole trend of politics at this time — the crypto-Catholic movement, burrowing its way into Protestant England; the capuchins flitting about between Whitehall and St. James's; the alliance with the French against the Dutch, and the prolonged war with Holland; the plottings and placings of the Cabal, and the quarrels and changes in the royal harem, which had pushed up to the very door of the house in Pall Mall — must have been utterly distasteful to Robert Boyle and his passionately Puritan sister. 1625-1672. The generous benefactor and patron of Pepys. A strong supporter of Oliver Cromwell and later his son Richard. After lying low, he later, at the start of the Diary switched his loyalties to the Royalist cause and supported Charles II. Elected as a member of the Council of State, co-General at Sea and Commissioner of the Admiralty.